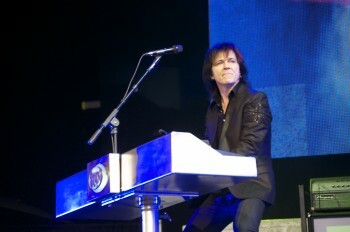 Lawrence Gowan is currently the keyboardist/vocalist in Styx. 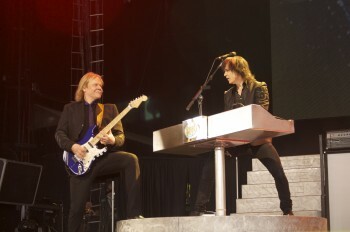 He has toured the world as a member of Styx and as a solo artist. We would like to thank Lawrence for taking time to talk to us while out on the road with the Styx/Yes tour. Rock Show Critique: How has the tour gone so far? Has it been what you expected? 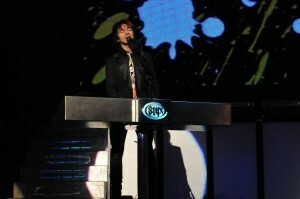 Lawrence Gowan: It’s a tour I’d been hoping for 10 years. Chris Squire happened to see us play in NY in 2000. Six months later I was at a Yes show, he came up to me and said I saw Styx with you in NY. The show was great we should tour together someday he called it progpalooza. I kept expecting well next year it will be us and Yes and it just never happened. So 10 years later, management is into it, and our management loves that idea and were one of the earliest to embrace it. So finally we get to do it. Just getting a chance to play with that band and hearing those songs every night. For someone like myself who was such a fan it’s amazingly bizarre but also beautifully surprising to be backstage and hear “Heart Of The Sunrise” and “And You And I” while I’m warming up on my keyboard trying to play along with it. Just hearing how Geoff Downes tackle those parts and he’s doing a great job, it’s been fantastic. And the audience has been eating it up. That’s another great thing. RSC: Has there been any talk of Styx recording a new studio album with all-new material? LG: There’s always talk Joe (laughs). There is a precarious situation we’re in. There is an insatiable demand for the band to play basically every day of the year, around the world. It’s very difficult at this stage of the career that everyone’s in to ignore that. For example we just got back from England and Sweden, and we came back here to start this Yes tour and then we begin another whole run of shows in the states that we missed on this Tour. It’s very difficult to just simply turn our backs on that and spend six or seven or eight months in the studio making an album. It’s very likely we will do that at some point but I can’t promise when. On the other hand we just finished doing another Regeneration, Regeneration Volume 2, a fresh take on more of the Styx classics. That’s important because there are probably at least one or two generations now that only know this incarnation of the band. I’m into my thirteenth year with the group. They just wanted to hear our studio versions of all these songs we’ve been playing live. That was important to tackle. In addition to that, That Grand Illusion/Pieces Of Eight tour that you saw last year, we filmed the show in Memphis. So that’s being put together right now. It’s being mixed and that takes a lot of input from the band, coming up with the concept of the DVD and how that’s edited together. That’s another whole commitment in time. So there are just not enough hours in a day or days in a year for us to tackle every thing that we’d love to do. RSC: Last fall Styx did the Grand Illusion/Pieces Of Eight tour. It’s to my understanding that a handful of those tunes were never played live before? Any talk on possibly doing any other albums in their entirety? LG: You know we saw how well that tour went over, in some ways it was the pinnacle, of what we’ve been building to for ten years. To really approach doing that tour and dissect those albums and reconstruct them exactly as they were recorded the obvious difference being the inclusion of my own voice. They went over so well that there was a lot of talk backstage that we gotta do Crystal Ball and Paradise Theater or we gotta do Cornerstone. I think it’s likely that at some point we will do that. I think the two albums we did were the best choices because those are the two I’m most drawn to. I think Pieces Of Eight is a tremendous musical statement from start to finish and I really enjoyed doing that. Some of those songs have never been done live. RSC: A few years ago you guys did that amazing 18 song medley? Any chance we may see “Why Me”, “Lights”, “She Cares” or “Light Up” appear in the set someday down the road? LG: Very likely, there are songs like “Mademoiselle” which was part of the medley at one point. The band is starting to notice there are album tracks that have become a lot people’s favorite songs. “Man of the Wilderness” is one of the standouts of this tour that we are currently on and that’s one we never put into the set with other bands cause our set’s cut down. But it went over so well that we had to include it in this run. So if we approach a medley again which is very likely, I have a feeling there would be another rotation of songs and perhaps “Why Me” could make it in there. Actually “I’m OK” went over so well that it made it into the regular set earlier this year, and likely that’s gonna come back again when this tour with Yes is over. RSC: So what do you have planned for the rest of 2011? LG: My last count there were between 40-50 shows to play the rest of the year. I know that next year is a similar thing where there are some options being considered. RSC: For the past two years you’ve done some solo shows up at Fallsview Casino, will you be doing more shows up there in the future? LG: I did four nights in the last year and all four were sellouts. I found just a sliver of time to reconnect with the pretty considerable audience I had during my solo days in Canada. Also some curious Styx fans who wanted to see some of my solo era, so our management basically said you should go do this cause they were getting more and more people asking about my solo stuff. I will very likely do another run at Fallsview next year. I may add some other theatre dates around the country but not sure as to where yet. So whenever I get a moment to breathe from Styx then I’ll do the solo thing. It’s what I love to do, It’s what I love to wake up in the morning knowing that I have a few thousand people to face at the end of the day and I have to account for myself well. RSC: Will you release any more solo material when time permits? LG: Yes, that is more and more likely as I’ve been laptop recording in hotel rooms. I’m able to map out a lot new of things that I kinda earmarked as solo pieces so I just want to get in the studio and finish them up when time permits. There will be some more solo material in the future. RSC: You’ve played a lot of concerts over the years, Are there any shows or venues that really stand out as special ones? LG: That’s a very difficult question to give a straight forward answer to. Every audience ends up in the same place, meaning they are in an ecstatic state by the end of the night. You saw the show, how people are by the end of “Come Sail Away” and they want the band to come back and play “Renegade” and I find that to be the great leveler. Whether we’re in Japan or Sweden or America or Quebec, I find that the audience suddenly we’re all in the same euphoric state that puts us in the same place. I know that sounds like a cosmic answer to that question but it really is the way I feel about it. Of course walking onstage in Wembley Arena in London, England or the two super bowls that we’ve played, the feeling you get walking out on the field knowing your gonna play to those audiences standout. When we were In Japan we played a date at the Tokyo Dome, or the Beacon Theater in NY, those are legendary places. You do have a tremendous sense of accomplishment in the fact that your feet are gonna step on those stages. For example a few weeks ago we played a place outside Chicago called Naperville there was about 9000 people there. They had to close the park down because they were too many people there for it to accommodate. By the end of the night that was just as pleasing as if we just finished playing at any one of the venues I just mentioned. At the beginning of the night it matters a lot but by the end of the night its no consequence. RSC: How about any venues you have dreamed of playing but have not yet done so? LG: Yeah sure, I would love to know what its like to go on stage at Madison Square Garden. Styx has done that on several occasions, and I haven’t had a chance to do that. On the other hand the last couple of times we’ve played The Beacon Theatre or just a week ago we played at Jones Beach those are exciting NY venues as well to play. We done the Meadowlands a few times in New Jersey, a tremendous venue as well, I’m only speaking from historical standpoint like the Royal Albert Hall in London. Those are standout historical places that are venerated around the world. It would be nice to stand on one of those stages someday. RSC: Did you ever get a chance to play Maple Leaf Gardens? LG: I did one time in 1985. “A Criminal Mind” went to the top of the charts in Canada, three weeks after its release. The Kinks were playing Maple Leaf Gardens and they needed to sell a couple thousand more tickets to fill the venue. So suddenly at the last minute I was added and sold a pile of tickets. I got to play the full Strange Animal album in Maple Leaf Gardens, that was my pinnacle in Canada. Funny enough the biggest concerts I saw in my life were Yes, Elton John were at Maple Leaf Gardens in the early seventies. Sadly it no longer exists as a venue. RSC: Before we go give me one memory or story you have from playing here in Buffalo as a solo artist? 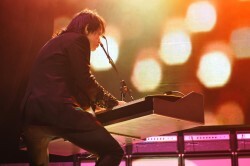 LG: It would be when I played at the Tralfamadore. Strange Animal never got a proper release in the United States, but because Buffalo is so close, the Lake is only about 20 miles across I believe, a lot of the airplay carried over. A few of the Buffalo stations started playing my stuff. I remember that being a major sense of accomplishment the first night I played at The Tralfamadore, the place was full, even though it was only a few miles away it still had the feeling of a foreign audience. It felt like the Strange Animal album was on the precedence of being released in the US and doing very well. The way the music industry was structured back then, the way the major labels had such a stranglehold on whose career when, where and what time. That didn’t play out that way. So that was sad but at the same time it gave me validation that there was an audience in America that I was determined to reach one way or another and eventually I was able to do so as a member of Styx. So that was my first taste of Buffalo at the Tralf. 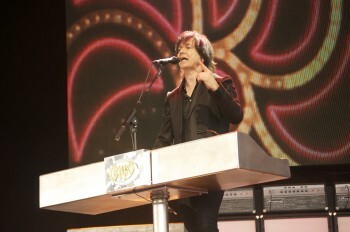 Special thanks to Amanda Cagan, Terry Gibson and of course Lawrence Gowan.